Do you love all things coconut and lime? You will LOVE these Coconut Lime Meltaways! There are only 4 simple ingredients and they are super simple to whip up! These meltaways are vegan, gluten free and paleo approved. They are the perfect treat when you want a little taste of summer. Who doesn’t want a taste of summer right now? 😉 If you like key limes, you can use those too! I think that would work out fine. We filmed a short video for this recipe. You can view it below. If you like videos, you can subscribe to my You Tube channel and you will never miss a new one. 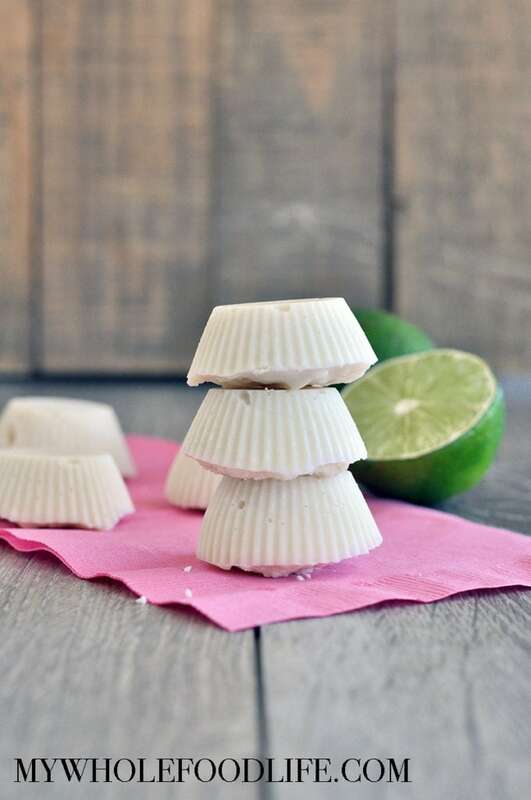 Just 4 simple ingredients to make these melt in your mouth coconut lime meltaways! In a large mixing bowl , add all the ingredients and mix until they are combined. Spoon a little batter into mini muffin cups. I used a mini muffin pan with silicone liners . Place in the fridge to set. It should take about 1 hour. If you want them to set faster, you can place them in the freezer. Keep these stored in the fridge. Enjoy! Can you use homemade coconut butter as well? Happen to know what the equivalent of the 3 Tbl. of maple syrup would be to liquid stevia?